The Winnebago Travato provides many options for those who love to explore! This Class B coach comes in at 21' long and is unbelievably agile along offering you a full featured RV experience. Be the first to break-in your new RV. As America's closest dealer to Winnebago Industries, we are able to stock motorhomes with only a few miles on our new Winnebago Travatos. 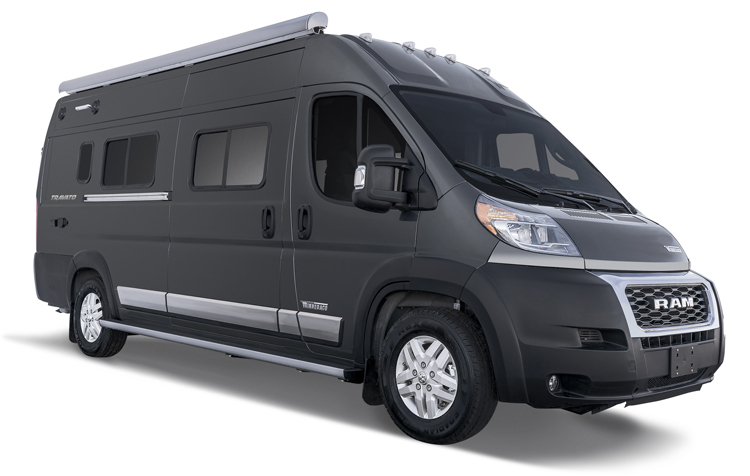 Based on the powerful, fuel-efficient Ram ProMaster® chassis, the Winnebago Travato® has been at the forefront of the B-van revolution since its launch. Thanks to premium features such as Corian® countertops, energy-saving Truma Combi™ eco plus heating, and the Deluxe FROLI® sleeping system, the new Travato is better than ever. With significantly upgraded standard features like 200-watt solar panels and new interior décor colorways, alongside several options, you can tailor the Travato to suit your needs. And now, Winnebago Industries® is introducing the most powerful advanced energy system in its class. The compact and easy-to-use Pure3 Energy Management System comes standard in the 2019 Travato® 59GL and 59KL. Pure3is built with advanced engineering and a simple user interface so you can have confidence and peace of mind as you travel down the road. This fully integrated system includes a powerful 3,600-watt pure sine inverter that offers 30 amps. of power at any time, powering air conditioning and appliances wherever you go.